Bert Cargill of Scotland, co-author or “Torchbearers of the Truth”, writes the following brief biography of the first man ever to translate the Bible into English from Greek, William Tyndale (1494-1536). Although John Wycliffe had done such pioneering work in making the first English translation of the Bible, William Tyndale is better remembered for his work which followed more than a century later. There are three reasons for this. First, his translation is much more accurate, derived directly from Hebrew and Greek texts. Wycliffe translated from the Latin Vulgate, itself rather inaccurate in places, but Tyndale was able to use the Greek New Testament, recently made available in Europe by Erasmus, and also to access Hebrew texts. Second, Tyndale’s English is nearer our modern form of the language, so that many of his words and phrases remain in versions we use today. It has been calculated that our Authorised Version New Testament (KJV) is 84% Tyndale’s work, while in the Old Testament 76% Tyndale’s. Tyndale was able to take advantage of the printing press, invented by Gutenberg in 1440, with the first Bible printed in Germany in 1452. William Caxton brought the technique to England in 1476. Clearly this facilitated better copies and wider distribution. William Tyndale was born in 1494 most probably at North Nibley in Gloucestershire. His was an ancient Northumbrian family, perhaps moving there following the Wars of the Roses. At the age of 11 he enrolled at Oxford University, grew up there, and received his Master’s Degree in 1515, aged 21. He proved to be a gifted linguist. One of his associates commented that he was “so skilled in eight languages – Hebrew, Greek, Latin, Spanish, French, Italian, English, and German – that whichever he speaks, you might think it his native tongue”. Then ordained into the ‘priesthood’, he was able to start studying theology. His earlier course at Oxford had not included the study of Scripture. He subsequently went up to Cambridge, possibly studying under Erasmus, one of whose books written in Latin in 1503, The Handbook of the Christian Knight, Tyndale translated into English. Erasmus was one of the most distinguished literary figures of his day. He was prominent in that great revival in Western Europe of Greek and classical studies which resulted from the flight of many Greeks to Italy when the Byzantine Empire had finally collapsed and Constantinople had fallen to the Turks in 1453. Around 1520, Tyndale became a tutor in the family of Sir John Walsh, at Little Sodbury in Gloucestershire. 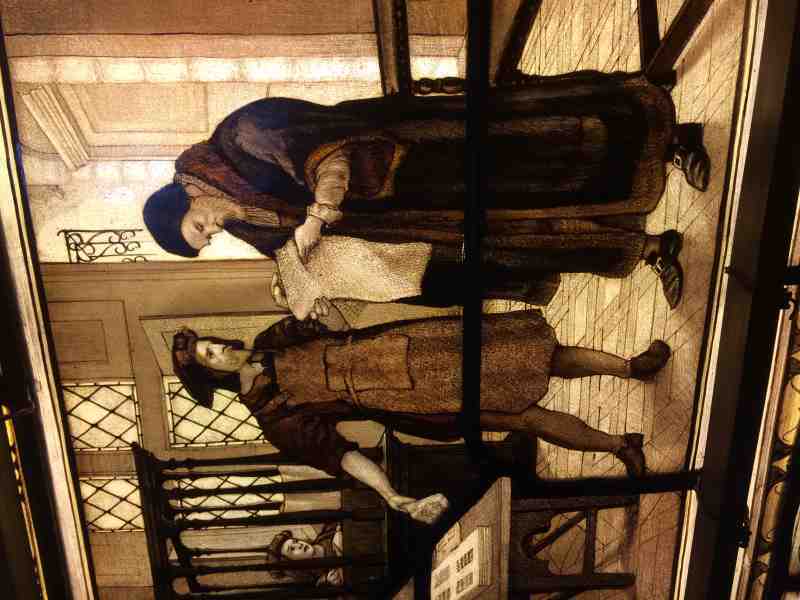 There he devoted himself more to the study of the Scriptures and embraced the doctrines of the Reformation. His opinions involved him in controversy with his fellow clergymen, and around 1522 he was summoned before the Chancellor of the Diocese of Worcester on a charge of heresy. This led to his move to London (about October, 1523), where he continued to preach what he believed to be the truth. 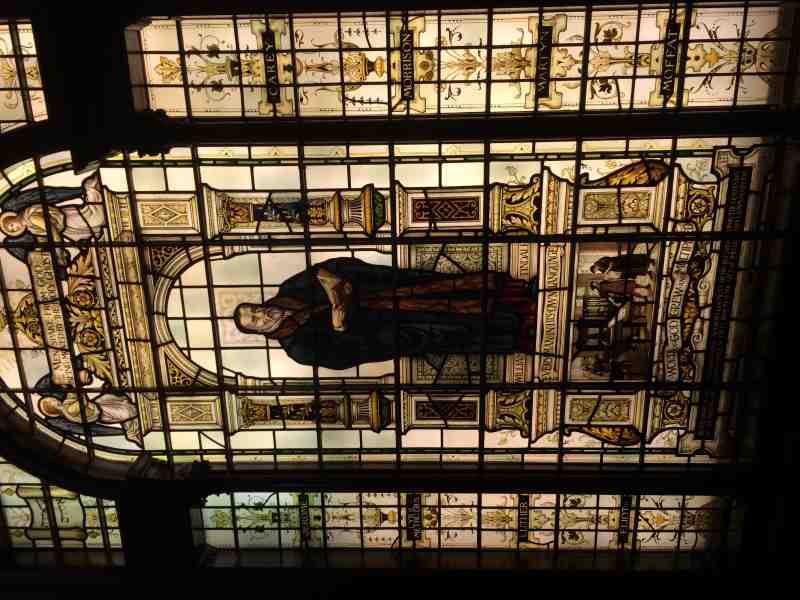 So in London in 1523 he determined to translate the Bible into English. He requested help from Bishop Cuthbert Tunstall, a well-known classicist whom Erasmus had praised after working with him on a Greek New Testament. However, the Bishop was suspicious of his theology and, like many highly-placed churchmen, did not like the idea of the Bible in the vernacular. Tyndale preached and studied “at his book” in London for some time, relying on the help and hospitality of a cloth merchant called Humphrey Monmouth. But as he became more unpopular, he then left England under a psedonym and landed at Hamburg in 1524 taking with him what he had done so far on his translation of the New Testament. He completed his translation in 1525, possibly in Wittenberg, with help from Martin Luther, and also Miles Coverdale and a friar called William Roy. In 1526 a full edition of the New Testament in English was printed in Worms. More copies were soon being printed in Antwerp, and many were smuggled into England and Scotland where they were to have an abiding influence. It was condemned in October 1526 by Tunstall, who issued warnings to booksellers and had copies burned in public. Cardinal Wolsey condemned Tyndale as a heretic and demanded his arrest. Tyndale’s other literary activity during this interval was extraordinary. When he left England, his knowledge of Hebrew was very rudimentary and yet he mastered it, so that by 1531, in just seven years, he had produced from the original Hebrew an admirable translation of the entire Pentateuch, the books of Joshua, Judges, Ruth, First and Second Samuel, First and Second Kings, First Chronicles, and Jonah. In addition to these he produced several books and pamphlets about the authority of Scripture and severely critical of established Church practice. All these were written in places so secure and well hidden that the ecclesiastical and diplomatic agents of Wolsey and Henry VIII, charged to hunt him down and seize him, were never able to find him. 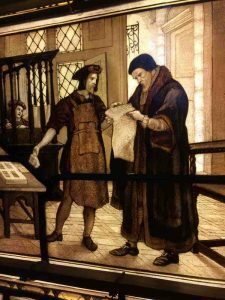 In 1534, believing that the progress of the Reformation in England made it safe for him to leave his place of hiding, he settled at Antwerp and combined the work of an evangelist with that of a translator of the Bible. 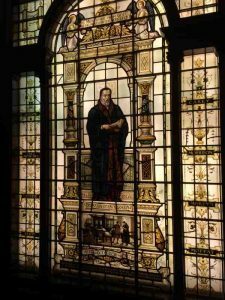 The great stained glass Tyndale window in Hertford College, Oxford, England. With this, the voice of a great man aged just 42 was silenced. But his work remained, and his prayer was answered very soon afterwards, for in that same year Henry VIII instigated the Dissolution of the Monasteries and began extensive religious reforms which would include the placing of a Bible in every parish church in England. Tyndale’s original translation was the foundation of the great translations which quickly followed afterwards. These included the Great Bible of 1539, the Geneva Bible of 1560, the Bishops’ Bible of 1568, the Douay-Rheims Bible of 1582–1609, and, most notably, the Authorised Version of 1611 (KJV). In translating the Bible, Tyndale introduced new words into the English language, many of which have become well loved by today’s readers of the AV. For example, it was Tyndale who composed the name Jehovah from the Hebrew Tetragrammaton YHWH, as also the words passover, atonement, and scapegoat. Some of his new words and phrases, however, did not suit the hierarchy of the Roman Catholic Church. They did not want ‘overseer’ to replace their word ‘bishop’, nor ‘elder’ for their familiar ‘priest’, nor the more accurate word ‘congregation’ for their word ‘church’. Tyndale contended (citing Erasmus) that the Greek New Testament did not support the traditional Roman Catholic readings, and history has proved him correct. Yet the influential Thomas More had said that searching for errors in the Tyndale Bible was like searching for water in the sea! Because of his work on the translation of the Bible, William Tyndale is frequently referred to as the “architect of the English language”. His influence on English has been as wide as Shakespeare’s. Many of the phrases Tyndale coined are in our everyday language. We quote him when we use phrases such as the powers that be; my brother’s keeper; the salt of the earth; a law unto themselves; it came to pass; fight the good fight; and the signs of the times. And when we tell great Bible stories or declare the wonderful message of the gospel, the familiar words we use are often Tyndale’s. What a legacy he left to us!